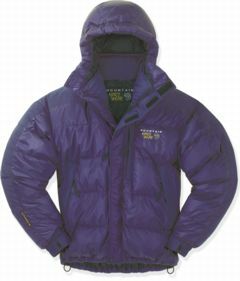 Heavy frost, snow on the peaks - now is the perfect time to consider investing in a down jacket. These comfy coats will keep you snug in the coldest of conditions and as well as being ideal for walkers and mountaineers, they are also great for skiers. Colours black, charcoal, glacier blue. The Below Zero SL Hooded Jacket from Mountain Hardwear is an excellent compromise between ultimate warmth, water protection and manageable size. At just over 1000g for a large man's jacket, it isn't the lightest on the market by any means but it does pack down into an impressively small bundle and comes with a handy stuff sack to keep things neat and tidy. The Conduit shell is a specially formulated non-porous membrane containing inter-molecular gaps that allow water vapour to pass between them when activated by the positive pressure exerted inside the jacket while it is worn. Sounds like impressive stuff, and it is! My test jacket was quick to bead water on a recent trip into the wilds of wettest Angus and the goose down fill kept me snug at Gayfield Park which, as well as being home to Arbroath FC, is also one of the coldest places around in December! The jacket is full of useful features including a fleece-lined collar and pockets for extra warmth, a detachable down hood and an interior mesh pocket which can accommodate a water bottle. Areas prone to high abrasion and therefore greater wear are reinforced with Supplex taslan to increase durability. My only gripe (and it's a complaint not confined to just this garment) is the inclusion of a double headed zipper. Being able to zip open from the bottom may be a handy feature in a full-length jacket but it isn't really necessary in one designed to sit above the waist. More often than not these things are terribly fiddly and nigh-on impossible to slot home first time with cold fingers. Overall, a very impressive garment and one which would be ideal for skiing in too. Colours electric blue, cherry, tumbleweed, navy, black. This jacket has been designed for Alpine summer and Scottish winter use, down to -10 degrees celsius, and suits both climbers and skiers. It features a water resistant Drilite outer over a down fill and, according to Mountain Equipment, has even been used on the summit of K2. Content-wise, the jacket features a mix of 90% down and 10% feathers, ensuring plenty of warm air is trapped within. Weighing in at 620 grams, it is light and packs down well, coming complete with its own stuff sack. Unlike down jackets I have worn in the past, there was no occasional departure of down through the outer fabric during the test, which indicates the Lightline should perform well for a good long time. There are two hand warmer pockets and a stretch mesh inner pocket. The lower pockets are comfortably located. The collar is lined with Tharmastat fleece which is great for those of us who let the chin stubble grow. I have a down jacket from another manufacturer without a collar lining and within a matter of days short beard growth had damaged the fabric round the neck, so this is a useful and welcome feature on the Mountain Equipment model. Also useful is the handy detachable hood, which can be left in the rucksack, or stowed in the inner pocket when it's not needed. On the subject of protecting the outer fabric from wear, the Lightline also has taslan patches on the shoulders and sleeves to stop rucksacks rubbing into the fabric. As to the fit, this jacket is very comfortable and hugs the body without being too tight, even over a fleece or jumper. The sleeves are of a good length and the collar not too tight. There's a two-way zip on the front with a Velcro fastening storm-flap over the top (plus a stud at the bottom of the zip). In short, a great lightweight down jacket that performed exceptionally well.